THE ANNE LANDA AWARD was the first acquisitive award in Australia to focus on moving image and practices and the application of new technologies to contemporary art. Established in 2004, in honour of Anne Landa, a former trustee of the gallery who embraced challenging art and ideas, the award is a vital platform for presenting and supporting dynamic, exploratory work that is exemplary in this area. The participating artists are eligible for the acquisitive award of $25,000, which sees the winning work enter the Gallery’s collection. Previous winners include: David Rosetzky 2004/5, Monika Tichacek 2006/7, TV Moore 2009, and David Haines and Joyce Hinterding, 2011. The exhibition The space between us considers the interrelation of video and performance. The fifth in the biennial Anne Landa Award series, this year’s edition is guest-curated by Charlotte Day, Director, Monash University Museum of Art, and features the work of artists Lauren Brincat, Alicia Frankovich, Laresa Kosloff, Angelica Mesiti, Kate Mitchell, James Newitt and Christian Thompson. The seven artists are connected through their interest in the artist as performing body, the artist as creator/director of performances, and the viewer’s role in relation to the works and as active participant. This resurgence in performative art continues out of a desire to question and test established exhibition and viewing habits, as well as the relative distinctions and distances between artist, artwork and audience, said Charlotte Day. The exhibition incorporates many live as well as documented performances; visitors may experience tambourine players, women on horseback, groups of people testing their physical endurance and other unexpected encounters in the vicinity of the Gallery. A digital publication has been produced in association with the exhibition. This publication is available via an app for iPad and include essays, documentation of exhibited works, video, audio and other interactive features. Sydney-based Lauren Brincat recent work High Horse 2012 is a video recording of an endurance performance in which the artist stood on top of a horse in a pose inspired by a statue of Joan of Arc she saw in Paris. For this exhibition, Brincat will also direct two live performances involving women on horseback riding to the Gallery and 50 people playing tambourines in the Gallery’s entrance court. Berlin-based Alicia Frankovich appropriates movements and gestures from sport, dance, art history and cinema in her performances, video documentation and sculptural installations. Part of her work in this exhibition is a performance involving a group of joggers, directed by Frankovich in the Gallery’s entrance court. In her new work, Melbourne-based Laresa Kosloff has filmed viewers in the grand courts at the Art Gallery of New South Wales. Kosloff’s project reconsiders who is the subject and what is the object of art and re-establishes the potential for participation and performance in the Gallery. The four-screen video of Paris-based Angelica Mesiti records diverse performers who in the Western cities they now live in each maintain ties with their birthplace through rhythm, sounds and music. This ambitious video project reflects on deep and powerful memories of the performers and how experience may flow from the inner body into the social space of the community. Sydney-based Kate Mitchell presents a new work in which she smashes through a series of coloured glass panes, creating a video installation that showcases her interest in performing stunts and pushing herself beyond her comfort zone. 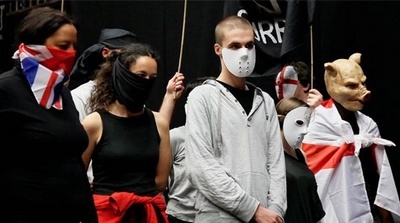 A new video by Lisbon-based James Newitt, made during a residency in Liverpool, UK, shows the evolving dynamic between two opposing groups of volunteers whom he brought together to enact a protest rally. Oxford-based Christian Thompson employs his father’s Bidjara language, taking the word for the bullroarer, djuldibha, to create an immersive and meditative soundscape of both language and the sound and rhythm of an ancient technology designed to communicate over great distances.